Received a homecare treatment worth $40 ! Using ultrasonic wave technology, the particles of protein, water and oil is separated during the treatment to allow nutrients to deeply penetrate into your hair structure. The results? Soft , smooth and glossy hair. Japanese professional hair care brand – selecting only the finest ingredients for our products. Specially selected ingredients include Amino acid and 2 types of keratin (wool & feather) , which will help to repair and restore shine in your hair. Refine your looks at a special price. Available on weekdays exclusive to male customers. Using the non-alkaline agent perm solution and MICHAELA's hair technology knowledge, A perming with no damage can rarely be found no matter in Japan nor Singapore. With our signature perming,we minize the damages of perming your hair. We propose an ideal hair design suitable for hair quality that can only be a MICHAELA stylist with high ironwork technology and chemical knowledge. 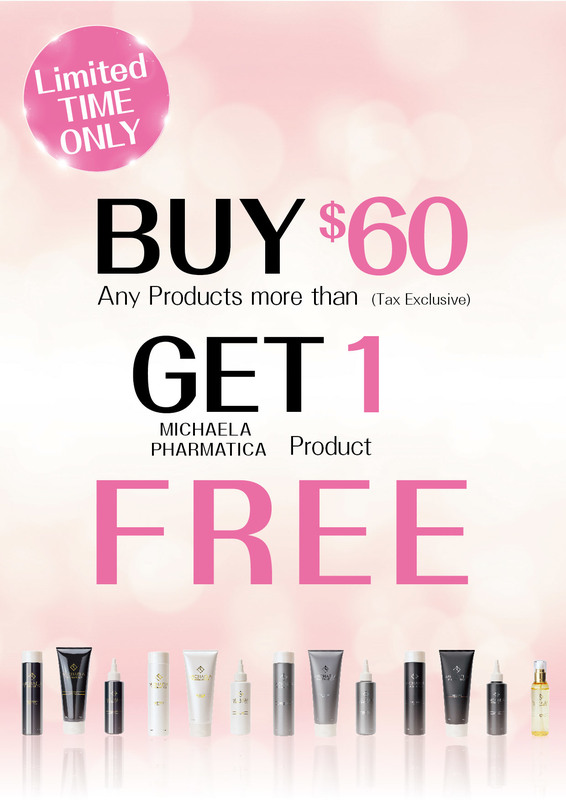 Buy and Get 1 Free MICHAELA PHARMATICA product Campaign!! All menu at 20%OFF for the first visit! Click here to check products of "MICHAELA Pharmatica"